I have made it into the top 4 Finalists for Awesome Calgary and will be doing my 90 second pitch this Thursday at 6 pm at Mt. Royal. If I win, I will get $1,000 towards my project. So what is the Gratitude Rocks Project? 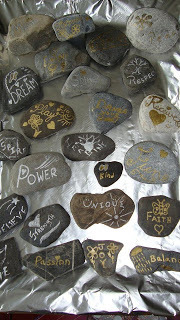 It is working with people at the Calgary Drop-In Centre (for homeless people) in their art department and having them create rocks with one of the key words from each of the 26 faeries in my book. For example, Balance, Fun, Play, Power, Courage, Strength. They will get paid $1.00/rock which will be of a size that a person can hold in their hand. When a person receives the one of a kind rock, they must give it away at some point to a person that they feel needs the rock’s message. Then they will have to share their story and I in turn will share that with the people who created the rocks. I am working on the distribution with the shelter as well as some local Calgary businesses, so that we can make this be an “evergreen” project. Here’s to changing the face and stigma of homelessness by supporting and inspiring them and others at the same time.